i8c - Business Integration Architects: ESB = Erroneous Spaghetti Box? While re-reading the Microservices article by Martin Fowler, I was triggered by the following footnote #7: We can't resist mentioning Jim Webber's statement that ESB stands for "Egregious Spaghetti Box". 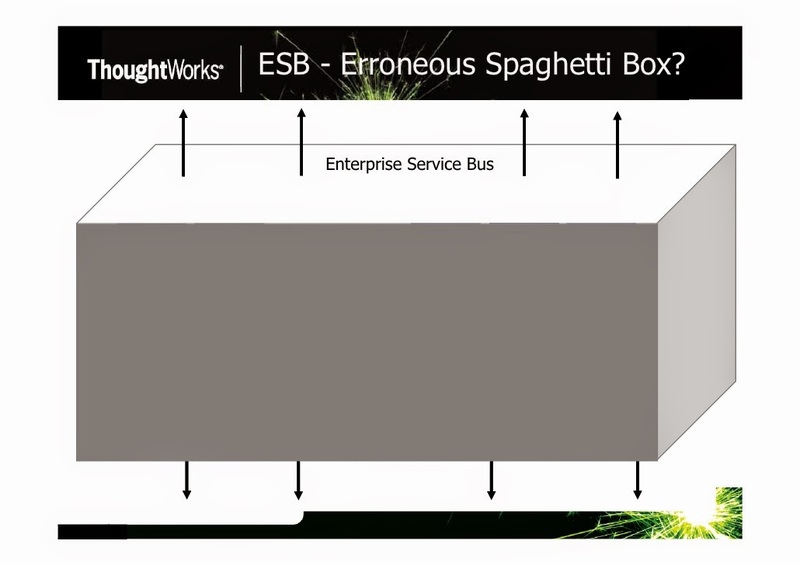 I viewed the presentation - from 2008 - in which Jim Webber and Martin Fowler bash the Enterprise Service Bus and translate the acronym ESB into Erroneous Spaghetti Box. I do agree that often, the integration platform simply contains a spaghetti of point-2-point integrations. But that's good! Way better than all that integration logic dispersed over many systems. With a wide variety of integration techniques, protocols and message formats. And spaghetti in a box is exactly what I tell when explaining what an integration platform is. Only by taking the next step of careful service and message design, one can arrive at a true Service Oriented Architecture. The cost of the integration development and support becoming truly visible. Where Webber and Fowler do have a point, is that middleware vendors come with a whole slew of products. Obviously one should only pick the parts that are useful. And the ESB will definitely not create the Service Oriented Architecture for you.